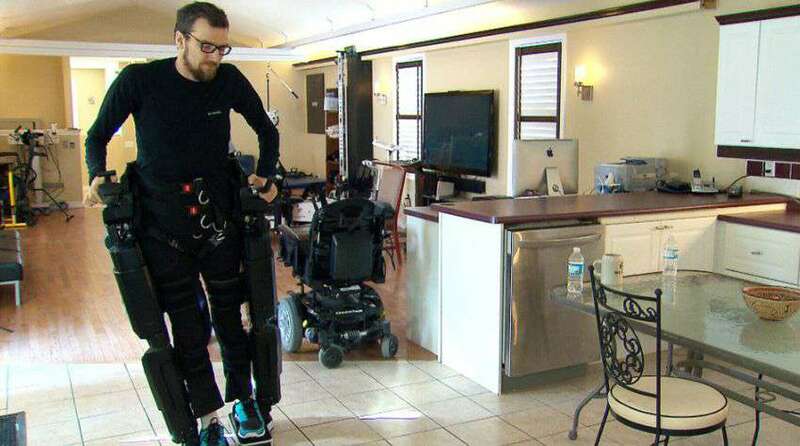 A new starting for the completely paralyzed patients, with the use of wearable robot or robotic exoskeleton which will allow them to take thousand steps out or walk again with robotic step training and noninvasive spinal stimulation. Ekso Bionics helps survivors of stroke, spinal cord injury and other forms of lower extremity weakness to walk again. The robotic exoskeleton has changed the course of recovery in gait training and neurorehabilitation by augmenting not only the individual’s strength, but the therapist’s ability to work with their patients. Ekso Bionics is at the prominence of a technology, manufacturer of orthotic and rehabilitation products. Ekso began life as a sequence of advanced progress at the robotics and human engineering lab at UC-Berkeley. Engineers figured out how to produce an exoskeleton that runs on a fraction of the power of existing models. According to the U.S Secretary of Veterans Affairs Robert McDonald and Deputy Secretary Sloan Gibson the “best thing” he’s seen on the job so far is the wearable exoskeleton which is helping wounded veterans stand up and walk again, even after decades. A man was fitted into an experimental monitorized new exoskeleton created for a Darpa funded effort called the “Warrior Web,” was able to voluntarily control his leg muscles and take thousands of steps in a “robotic exoskeleton” device during five days of training, and for two weeks afterwards. Darpa-Funded Exoskeleton For Super Soldiers, a team of UCLA scientists reports this week. The project’s goal is to create a low power (under 100 watts), lightweight (40 lbs), under-the clothing exoskeleton that lets soldiers walk, run or climb farther and faster without extra effort. The warrior web exo is controlled by a computer attached to the camouflage backpaper, used their SCI rehabilitation program or an advanced production line simulation software. The computer reads leg movements and kicks in the right hydraulic boost, with the reassuringly RoboCop-like zzzt-zzzt-zzzt sound. Reggie Edgerton, senior author of the research and a UCLA professor of integrative biology, said that the robotic exoskeleton should help others with paralysis. A similar effort was made by an Israeli scientist Dr. Amit Goffer who developed ReWalk; he was inspired to come up with a new assistive device for walking after he was involved in an accident, and became a quadriplegic in 1997. According to Cerebral palsy, “the most common cause of childhood disabilities, so i was really interested in seeing if we could apply some of our robotics technologies to really helping these children have more function in everyday life.” There will be a new, improved technology soon which will be meant for the children. The age of the cyborg will bring a mechanical assist to all.